Mothers, lock up your daughters. James Franco is in town! And yes, it's James Franco asking you to lock them up! See, he wants you to keep his teen daughters away from him. 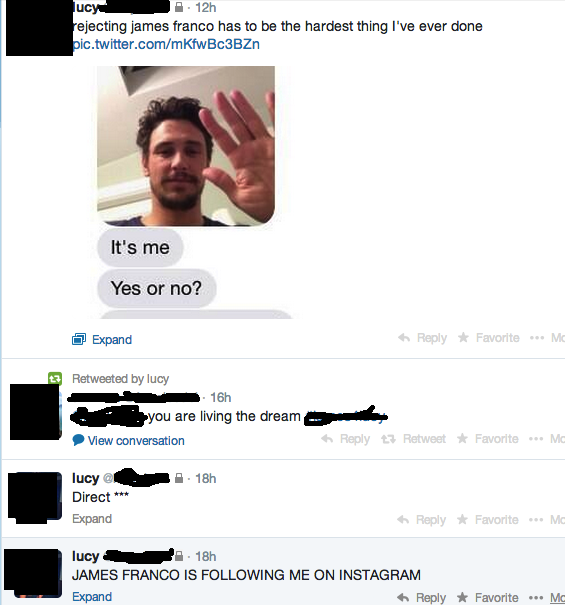 Because he's James Franco! Who knows what could happen! Actually, we have a fairly good idea what could happen based on what happened to 17-year-old Lucy Clode, a cute Scottish girl who happened to run into Franco outside of the theater where he's appearing in Of Mice & Men. James isn't immune to the lure of a pretty, young, blond girl. Emphasis on the young part. Because 35-year-old James allegedly didn't let Clode's short time on this planet stop him from putting the moves on the teen. Here's how it all went down, peeps. After Lucy spotted James outside the stage door, she took some selfies with him. At some point, the two supposedly began communicating through Instagram and someone, somewhere took screen shots of it and sent them to Reddit. The upshot is that, despite Lucy telling him more than once that she wasn't 18, James allegedly kept trying to get her number. Not even the fact that she was with her mother could put a damper on the film star's ardour. James: How long will you be in New York? Lucy: ... a few days. It's my 18th birthday present. James: Who are you with? Do you have a bf? Lucy: Nearly 18, my mum, and not if you're around. James: When is your birthday? Where are you staying? What's your #? Lucy: In May but I have exams then. Just off Times Square in a Hilton. What do you mean #? At some point, Lucy must have declined this very generous offer to get some private acting lessons from Franco, because in another exchange (this time through text), he allegedly tells her to "Be well" and she says, "I'll be back when I'm 18." But she suddenly does an about face and says she will meet him if he proves it is him by sending a pic of himself with her name written on a piece of paper. Dumb James fell for this, and it sure looks like him in that photo holding up a piece of paper with the name Lucy on it. He then reportedly went on to ask her, "Should I rent a room?" The whole thing hit the web (of course it did, hellllo, James, wake up, James!). And James took to Twitter to issue a "denial" that sounds more like a "Well, yeah, this happened but it's not my fault it's the PARENTS' FAULT." Was this tactless? Yes. Immature? Yes. Gross? Yes, but did anyone think Franco was Tom Hanks? However, there are those who think this is all one big publicity stunt, given that James has a movie coming out in which he plays a teacher who has a forbidden affair with Emma Roberts, his student. Orrr since the movie, Palo Alto, is based on his own short stories, maybe the whole May-December thing is just what James happens to be interested in -- in art and life. Was this girl too young for James? Was it real or a publicity stunt?